A couple of weeks ago I went out to Rockaway Beach for the first time since last fall/winter when the post-Sandy ravaged beach looked like it would never quite bounce back with its boardwalk blown to bits, its playgrounds’ asphalt erupting like lava from a volcano, and the large parking lot near 105th St. practically invisible under the mounds of sand that had made its way two blocks in from the shore. But bounce back it has—though not quite 100%—clearly through an amazing amount of effort, work, and expense by countless numbers of people and organizations. 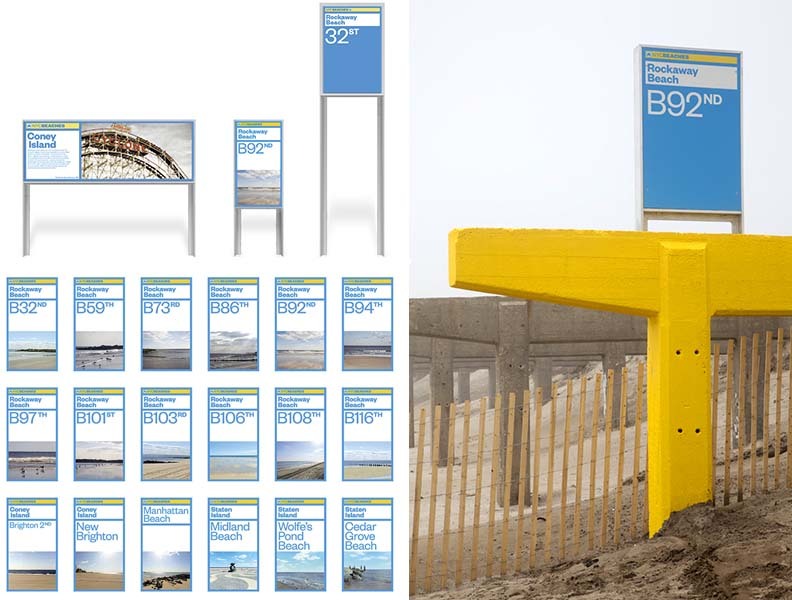 The boardwalk is still MIA but right away I noticed new, crisp signage clearly marking each beach name and street, as well as temporary concrete islands (designed by Sage and Coombe Architects) emblazoned with colorful supergraphics also displaying the corresponding beach numbers. Not surprisingly, I have since found out, perusing the Pentagram website, that the environmental graphics are the handy work of Paula Scher and her team of designers. 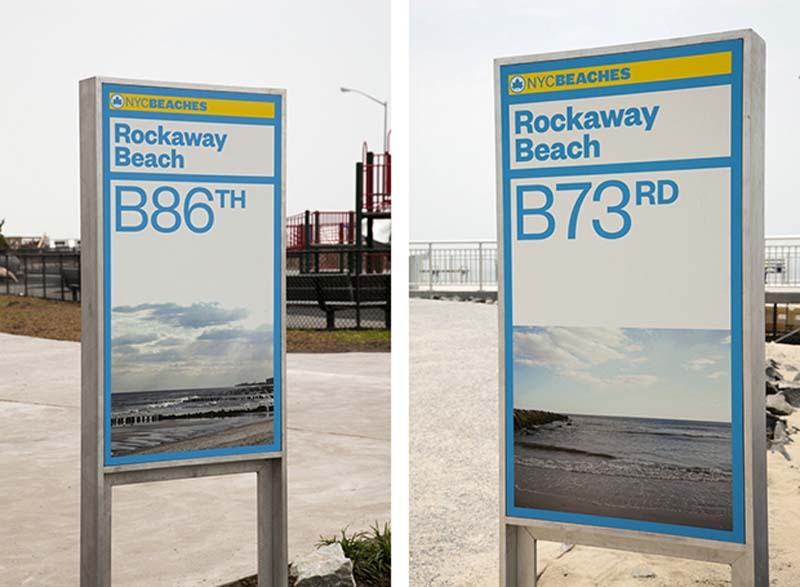 Scher previously developed the identity and signage standards for the New York City Department of Parks and Recreation, which manages and maintains the city’s beaches, and the beach graphics are an extension of that program, utilizing the logo but changing the fonts and colors. In addition, the graphics have been applied to the mod ‘pods’ designed by Garrison Architects that contain the lifeguard and comfort stations . These look a little more futuristic and slick in the renderings than in reality, but in truth, they weren’t completely finished when I was there. Impressive work all around, from clean-up, to graphics and architecture. By July 4th weekend it should all be in full-swing again, with many concession stands opening then. New Yorkers are a pretty invincible bunch. Photos and renderings courtesy of Pentagram & Garrison Architects. This entry was posted in Architecture, Graphic Design, NYC, Stuff We Like, Typography. Bookmark the permalink.